Over 100 colour /strength variations. & Polarize d lens options. 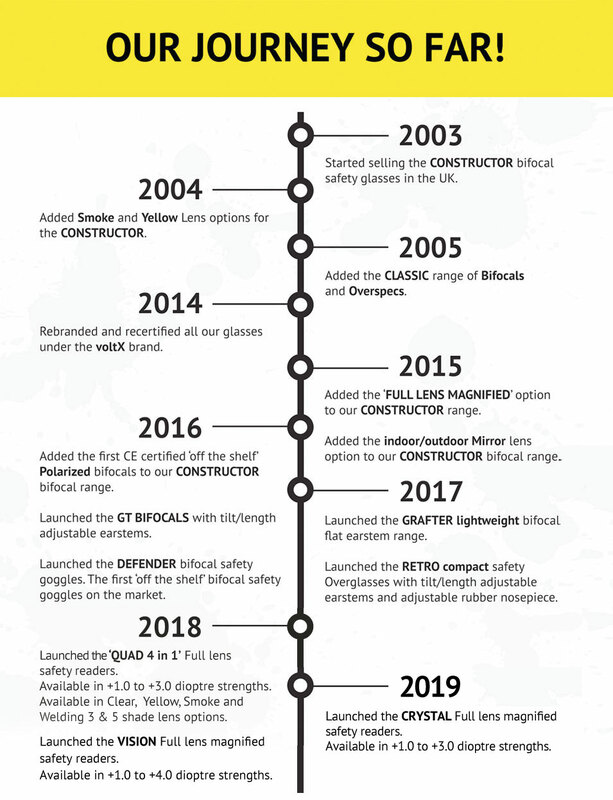 Back in the early noughties we introduced the first ‘off the shelf’ bifocal safety glasses in the UK. Bearing in mind that safety glasses by virtue of use will ultimately end up getting damaged, this was a massive amount and on par with an expensive power tool. We originally marketed our range of bifocal and reading safety glasses at specialized trade shows such as Interbuild, Woodmex, Electrex etc, as well as specialist consumer shows like the Model Engineering, Woodworking and Building shows and the glasses were an instant success. Now you had the option of buying a pair of ‘off the shelf’ reading or bifocal safety glasses for approx £10. If they got damaged during your work, they had obviously done their job and protected your eyes and were cheap enough to replace without breaking the bank. from public and private sectors alike. who need to be able to have the option of seeing the fine detail for their pursuits. rebranded all our glasses and started selling our glasses under the voltX brand in 2014. CE certified safety glasses across Europe, with over 120 different strengths, lens, style variations. CE certified safety eyewear on AMAZON UK, GERMANY, ITALY, FRANCE & SPAIN. with an average 4.8⭐ out of 5⭐ rating.